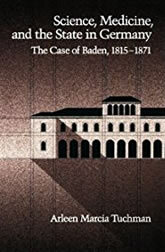 This superb account of the development of scientific research in the state of Baden places the growth of science in nineteenth century Germany within a broad social and economic context. The book analyses the progress of scientific research and its institutionalization in the state university system. Focusing on the experimental sciences, the book explores the introduction of the research ethic into the university medical curriculum, and the process by which laboratory science came to be an essential pedagogical tool in the education of future citizens of the state. The social and economic changes that ultimately transformed Germany into a modern industrial state are also considered. It was within this setting that laboratory training, once considered inappropriate for university studies, grew in status, and that dissatisfaction with the overly theoretical education traditionally offered by the universities began to increase. Thus, much like computers today, the scientific method in the nineteenth century came to represent an instrument for teaching not only specific skills but also a particular way of approaching, analyzing, and solving the problems of an industrializing economy. This compelling volume will be of interest to historians of science, medicine, and European studies.